SpaceX has successfully reused a previously landed Falcon 9 booster based on its final 'Block 5' design. 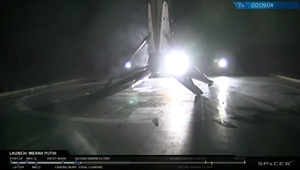 This is not the first time that SpaceX successfully relaunched a previously flown and landed (or as SpaceX describes them: flight proven) booster, but it is the first time that it landed a Block 5 booster. SpaceX is hoping to reuse Block 5 boosters up to 100 times, and to fly no less than 10 times without the need for maintenance. Last night, SpaceX launched a commercial satellite to geostationary orbit for Telecom Indonesia. The booster / first stage of the rocket was previously used back in May when SpaceX launched the Bangabandhu Satellite-1 into orbit. The promise of reflying boosters is to cut launch costs significantly, though initially SpaceX may opt to keep launch costs higher to recoup the significant financial investment into the development of reusable rockets, the development of the Falcon Heavy and the ongoing development of the BFR. NASA has also announced the first astronauts that will fly to space on a human-rated Dragon capsule from SpaceX. The Crew Dragon will have to pass a couple of test flights before the company will be able to fly humans.